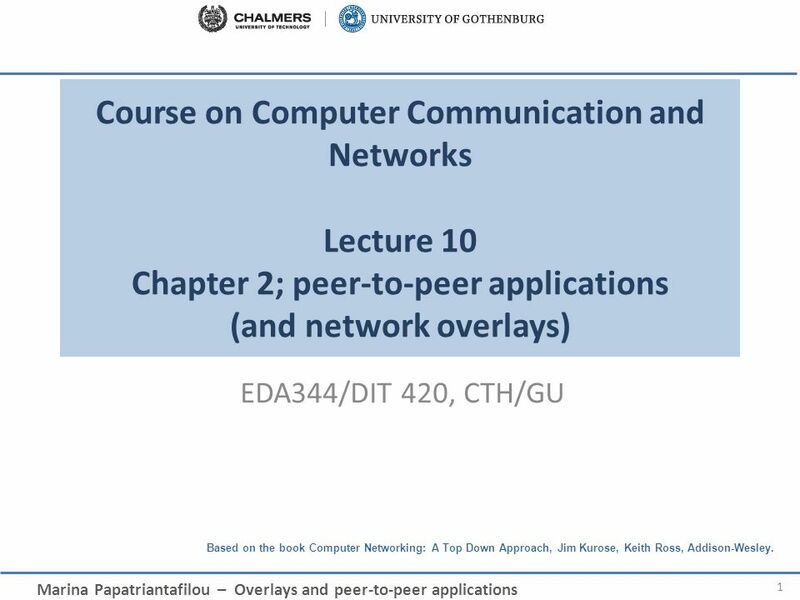 Course on Computer Communication and Networks Lecture 10 Chapter 2; peer-to-peer applications (and network overlays) EDA344/DIT 420, CTH/GU. 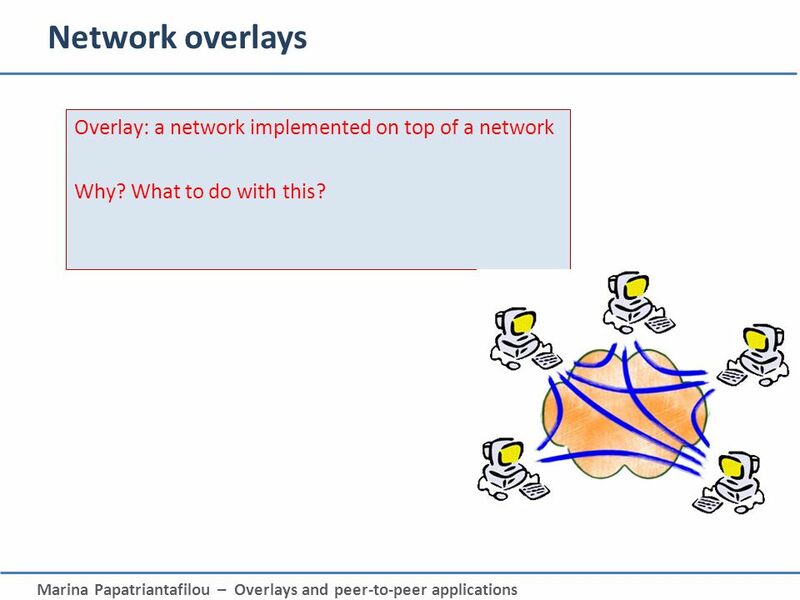 2 Network overlays Overlay: a network implemented on top of a network Why? What to do with this? 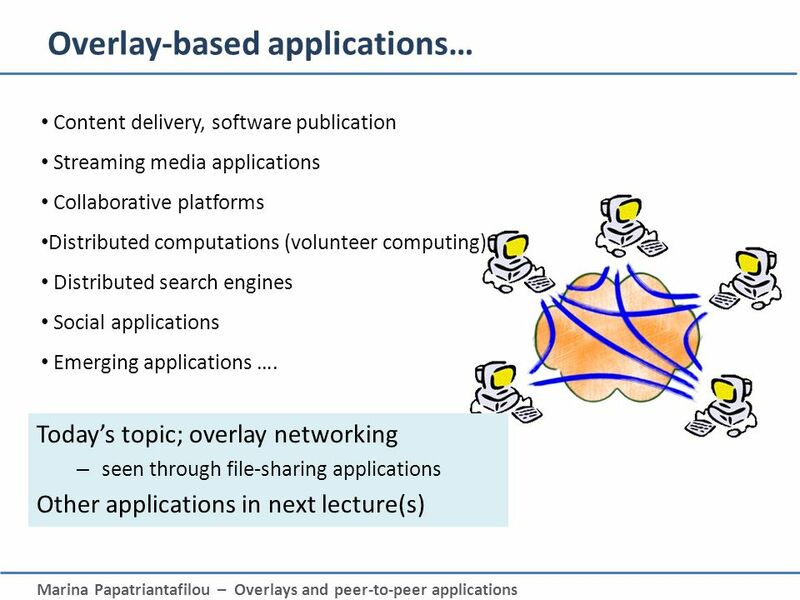 4 Overlays in file-sharing peer-to-peer (p2p) applications: what for? 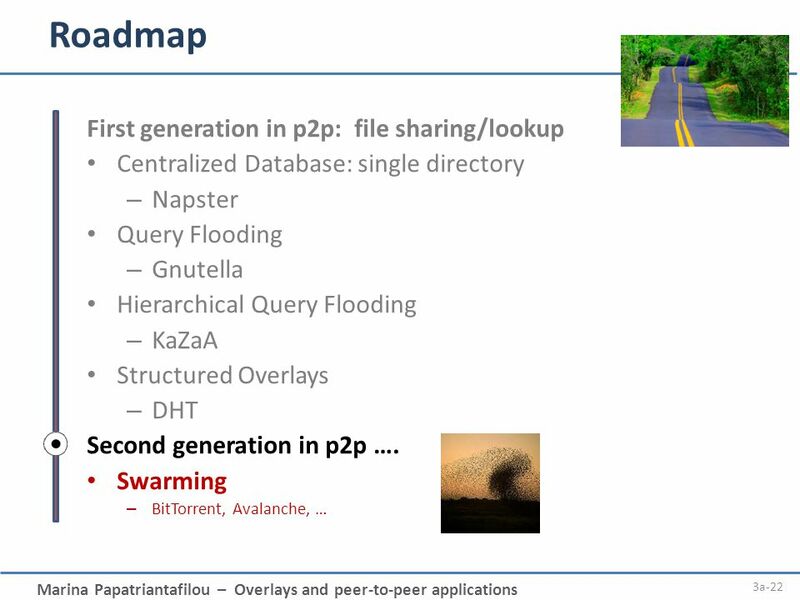 Background: Common Primitives in file-sharing p2p apps: Join: how do I begin participating? Publish: how do I advertise my file? Search: how to I find a file/service? Fetch: how to I retrieve a file/use service? Centralized Database: single directory Napster Query Flooding Gnutella Hierarchical Query Flooding KaZaA Structured Overlays DHT Second generation in p2p …. 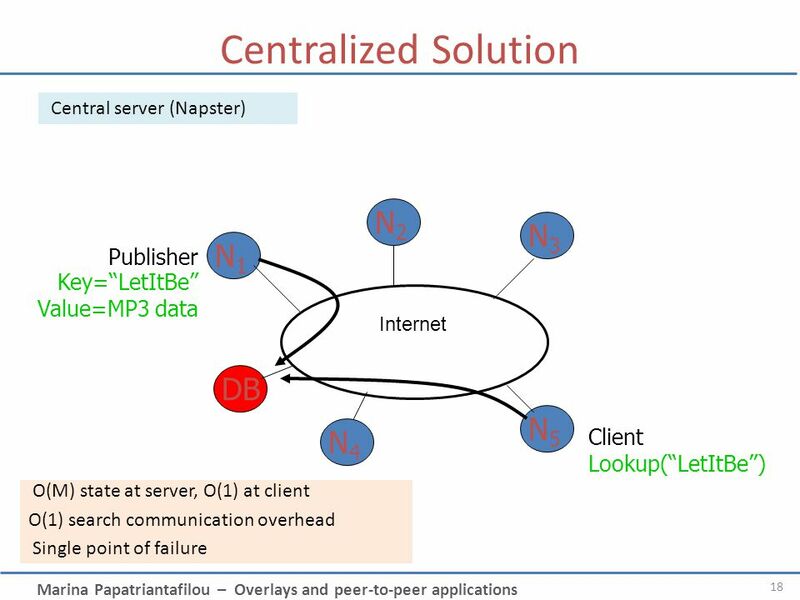 File transfer: HTTP centralized directory server peers Alice Bob 1 2 3 original “Napster” design (1999, S. Fanning) 1) when peer connects, it informs central server: IP address, content 2) Alice queries directory server for “Boulevard of Broken Dreams” 3) Alice requests file from Bob Q: What is p2p in this? 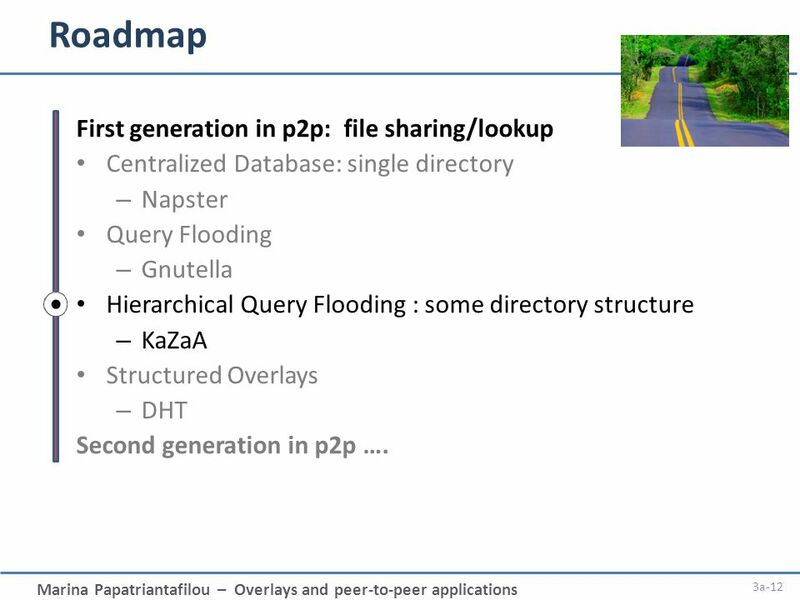 Centralized Database: single directory Napster Query Flooding Gnutella Hierarchical Query Flooding : some directory structure KaZaA Structured Overlays DHT Second generation in p2p …. 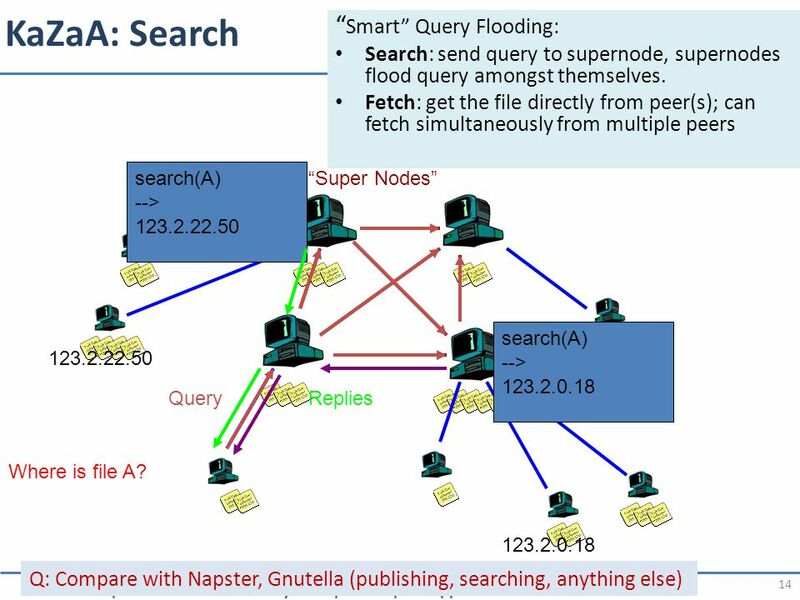 Join: on startup, client contacts a “supernode” ... may at some point become one itself Publish: send list of files to supernode “Super Nodes” insert(X, ) ... Publish I have X! Centralized Database: single directory Napster Query Flooding Gnutella Hierarchical Query Flooding KaZaA Structured Overlays Combine database+distributed system know-how Second generation in p2p …. 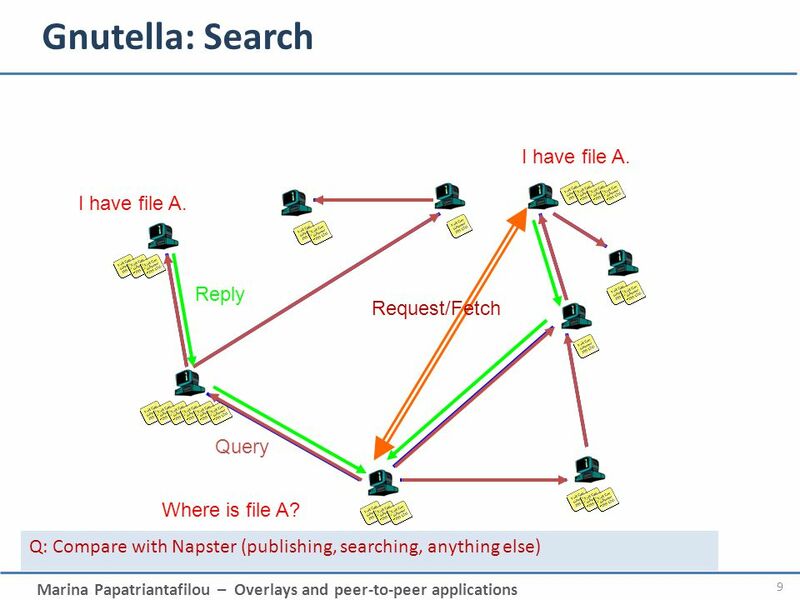 How to find data in a distributed file sharing system? (Routing to the data) N2 N3 N1 Publisher Key=“LetItBe” Value=MP3 data Internet N5 ? N4 Client Lookup(“LetItBe”) How to do Lookup? 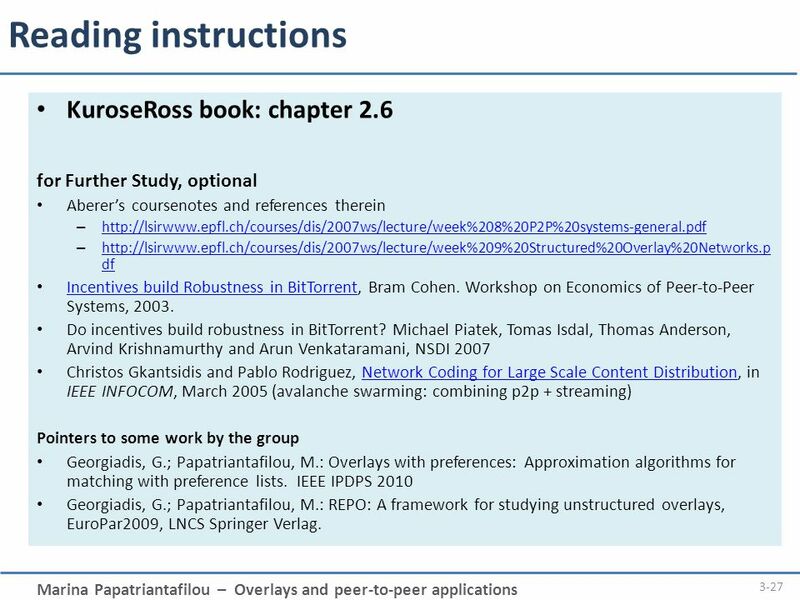 for Further Study, optional Aberer’s coursenotes and references therein Incentives build Robustness in BitTorrent, Bram Cohen. Workshop on Economics of Peer-to-Peer Systems, 2003. 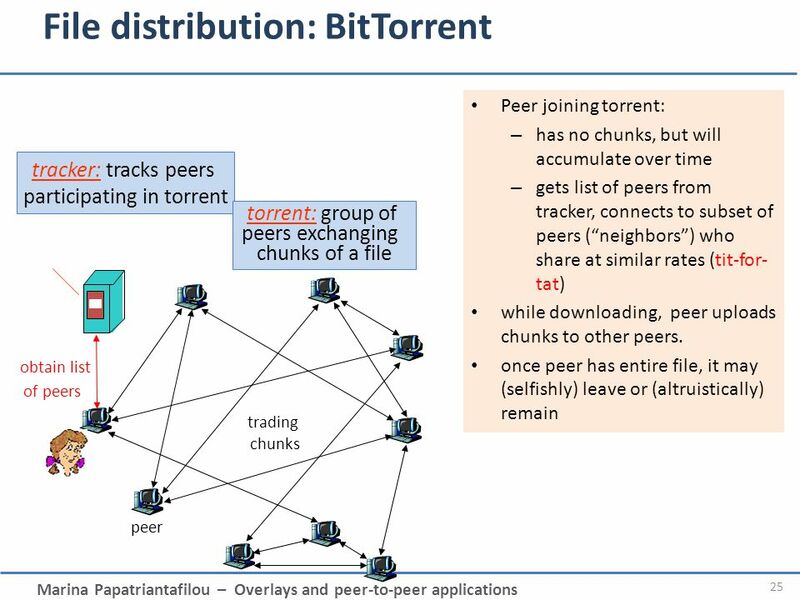 Do incentives build robustness in BitTorrent? Michael Piatek, Tomas Isdal, Thomas Anderson, Arvind Krishnamurthy and Arun Venkataramani, NSDI 2007 Christos Gkantsidis and Pablo Rodriguez, Network Coding for Large Scale Content Distribution, in IEEE INFOCOM, March 2005 (avalanche swarming: combining p2p + streaming) Pointers to some work by the group Georgiadis, G.; Papatriantafilou, M.: Overlays with preferences: Approximation algorithms for matching with preference lists. IEEE IPDPS 2010 Georgiadis, G.; Papatriantafilou, M.: REPO: A framework for studying unstructured overlays, EuroPar2009, LNCS Springer Verlag. 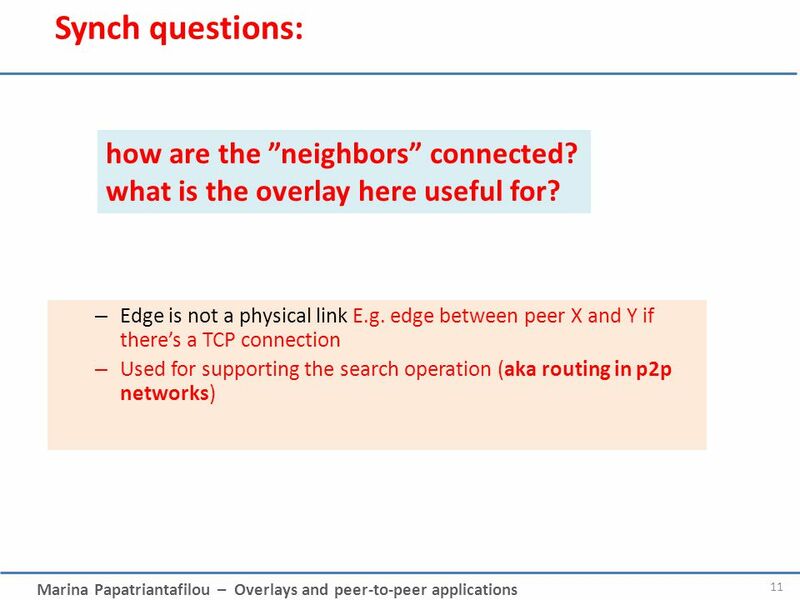 Download ppt "Course on Computer Communication and Networks Lecture 10 Chapter 2; peer-to-peer applications (and network overlays) EDA344/DIT 420, CTH/GU." CAN 1.Distributed Hash Tables a)DHT recap b)Uses c)Example – CAN. P2P data retrieval DHT (Distributed Hash Tables) Partially based on Hellerstein’s presentation at VLDB2004. 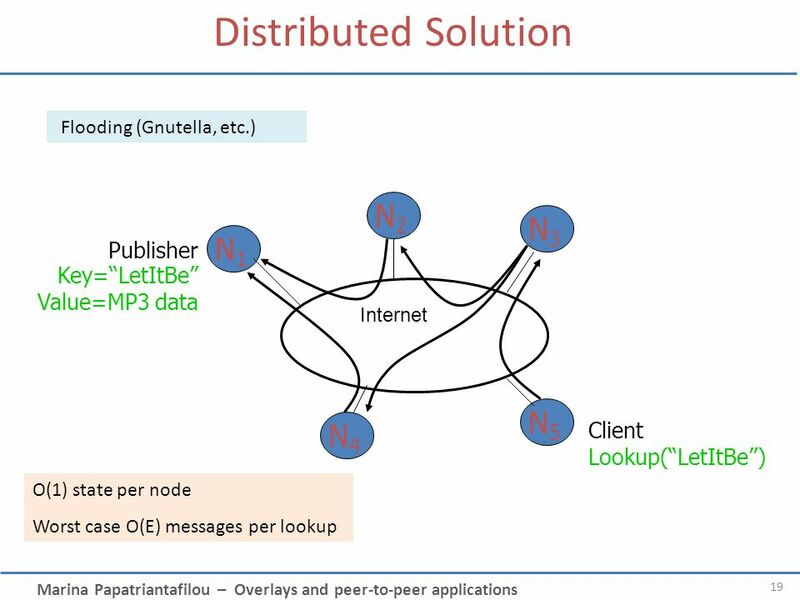 Ion Stoica, Robert Morris, David Karger, M. Frans Kaashoek, Hari Balakrishnan MIT and Berkeley presented by Daniel Figueiredo Chord: A Scalable Peer-to-peer. Chapter 2 Application Layer Computer Networking: A Top Down Approach, 5 th edition. Jim Kurose, Keith Ross Addison-Wesley, April A note on the use. Application Layer 2-1 Chapter 2 Application Layer Computer Networking: A Top Down Approach 6 th edition Jim Kurose, Keith Ross Addison-Wesley March 2012. No Class on Friday There will be NO class on: FRIDAY 1/30/15. 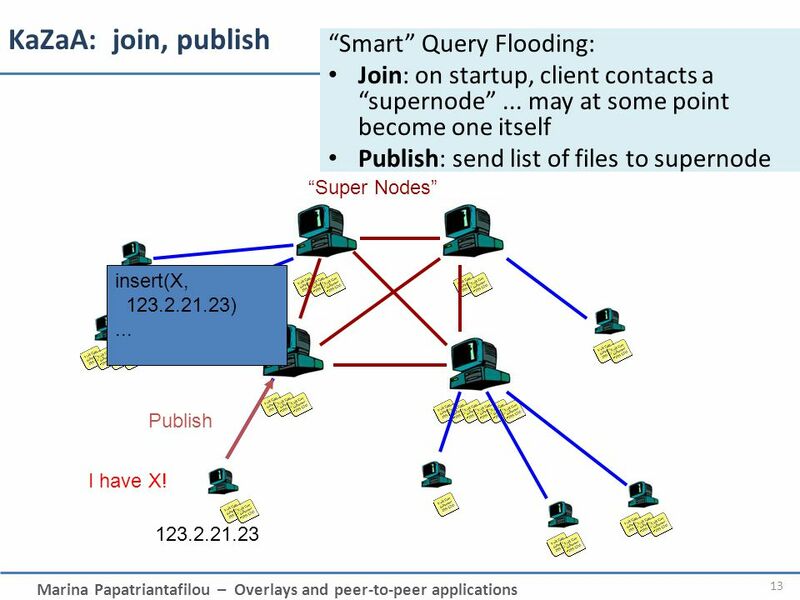 Peer-to-Peer Jeff Pang Spring Spring 2004, Jeff Pang2 Intro Quickly grown in popularity –Dozens or hundreds of file sharing applications. 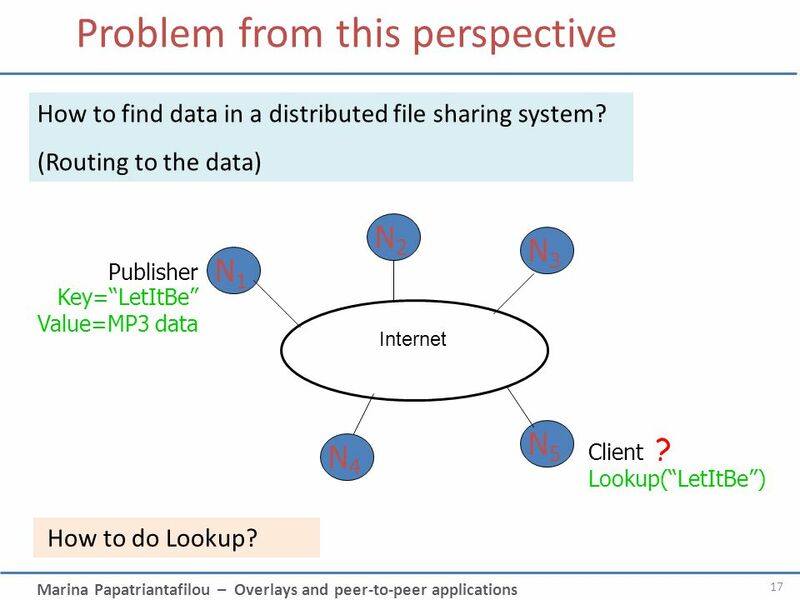 1 Chord: A Scalable Peer-to-peer Lookup Service for Internet Applications Robert Morris Ion Stoica, David Karger, M. Frans Kaashoek, Hari Balakrishnan. 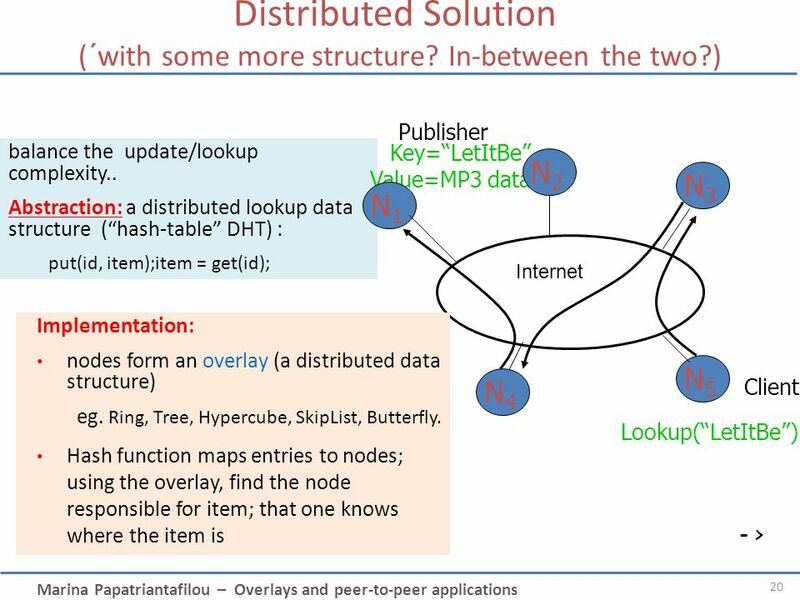 Topics in Reliable Distributed Systems Lecture 2, Fall Dr. Idit Keidar. 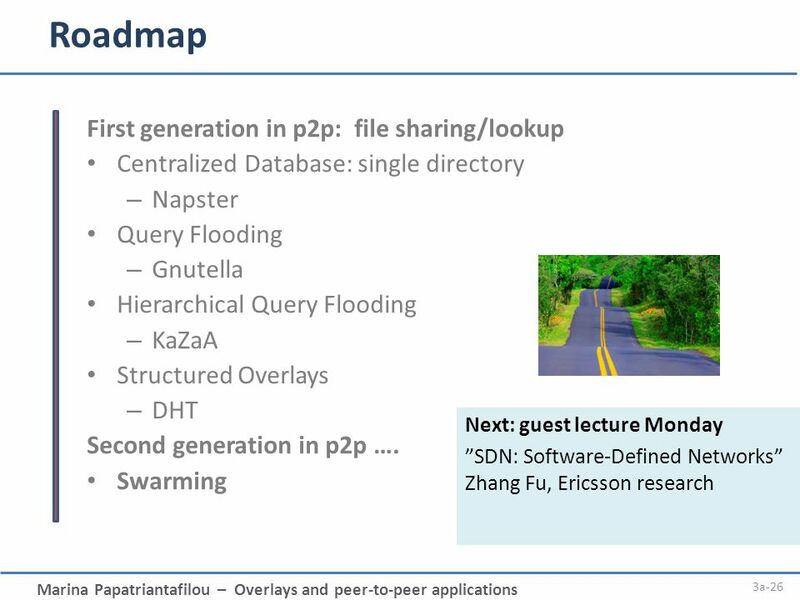 Spotlighting Decentralized P2P File Sharing Archie Kuo and Ethan Le Department of Computer Science San Jose State University. 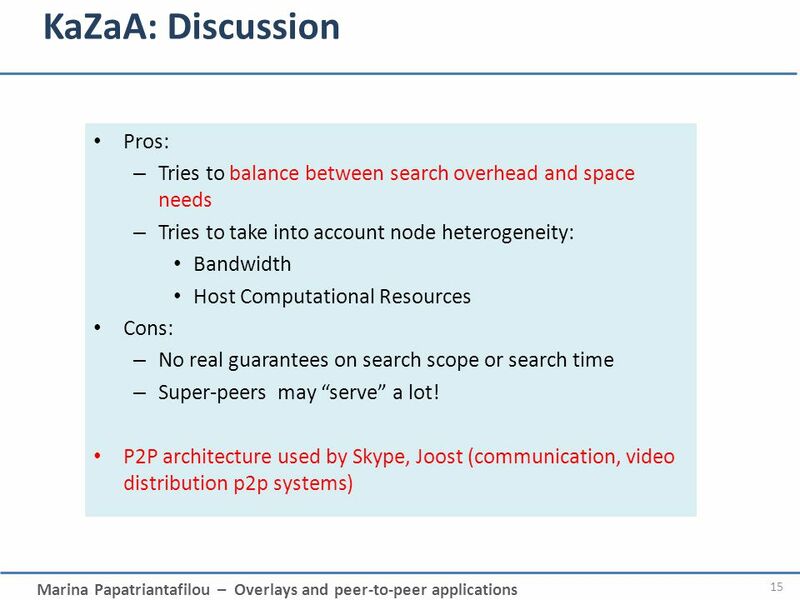 2: Application Layer P2P applications and Sockets. Introduction to Peer-to-Peer (P2P) Systems Gabi Kliot - Computer Science Department, Technion Concurrent and Distributed Computing Course 28/06/2006 The. CSE 124 Networked Services Fall 2009 B. S. Manoj, Ph.D 11/03/2009CSE 124 Network Services FA 2009 Some of these. 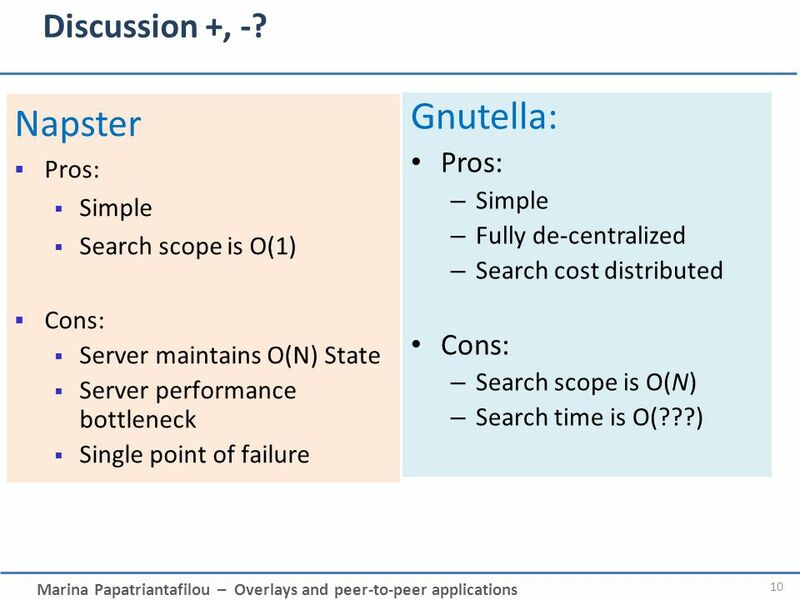 Topics in Reliable Distributed Systems Fall Dr. Idit Keidar. 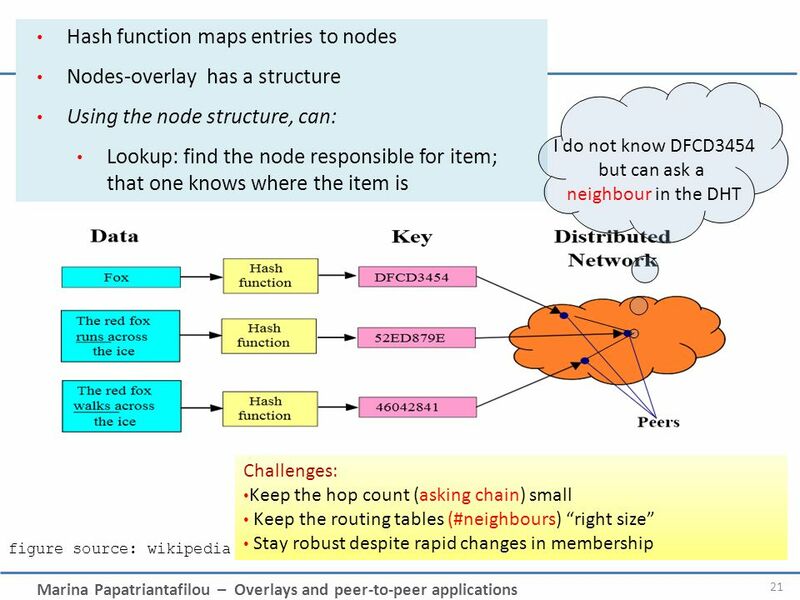 Peer To Peer Distributed Systems Pete Keleher. Why Distributed Systems? l Aggregate resources! –memory –disk –CPU cycles l Proximity to physical stuff. Lecture 10 Naming services for flat namespaces. EECE 411: Design of Distributed Software Applications Logistics / reminders Project Send Samer and me.